Lovely apartement with a sunny South-oriented loggia and a beautiful view on the canal. The balcony is very pleasant to take your meal outside and enjoy the stillness of the area. 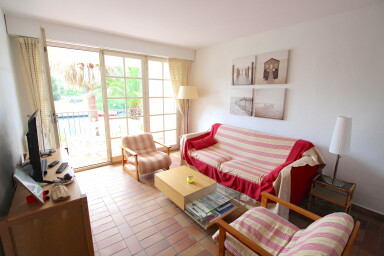 The apartment is well located in Port Grimaud South: in a quiet area close ot the private beach. It is composed of a living room with a renovated open kitchen, 1 bedroom with a large bed, 1 bedroom with bunkbeds and an additional bed underneath (3 beds in this bedroom) and a shower room. Numbered parking space at the bottom of the building. Perfect for family holidays close to the beach.